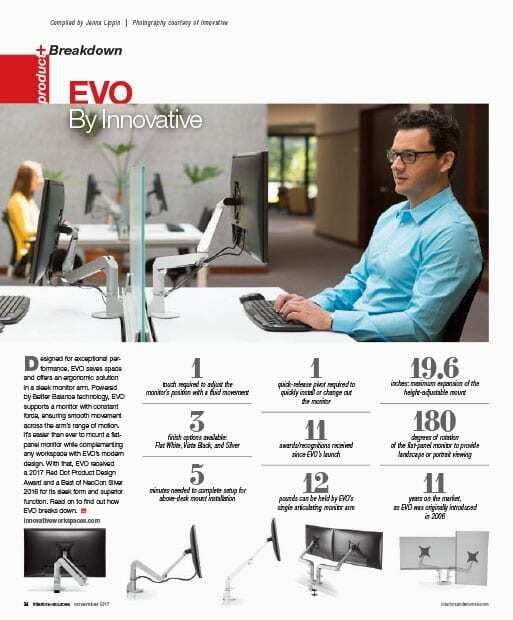 The award-winning EVO® Articulating Monitor Arm was recently highlighted by interiors+sources, read the article here. The third generation EVO® Articulating Monitor Arm has received a 2017 Red Dot Product Design Award for its superior function and sleek design. The newly introduced Winston-E® Sit-Stand Workstation received a Grand Prize in the 2016 Product Innovations awards sponsored by Buildings magazine at the 2016 NeoCon World Trade Fair. The third generation EVO® Articulating Monitor Arm was awarded Silver in the Technology Support category of the 2016 Best of NeoCon competition, sponsored by Contract Magazine and presented at the 2016 NeoCon World Trade Fair in Chicago. 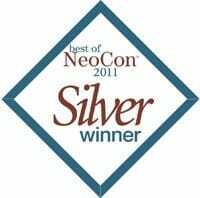 The newly introduced Tablik® was awarded Silver in the Technology Support category of the 2014 Best of NeoCon competition, sponsored by Contract Magazine and presented at the 2014 NeoCon World Trade Fair in Chicago. The newly introduced Busby® has been awarded a Merit Prize in the 2013 Product Innovations awards sponsored by Buildings magazine at the 2013 NeoCon World Trade Fair. Innovative is proud to announce that the EVO® LCD Arm has been awarded an Ergonomic Excellence Award by FIRA International. EVO® underwent extensive testing for ergonomics, structural and safety requirements of appropriate British and European standards and FIRA specifications. EVO® is available in the European Union through Innovative Europe. The newly relaunched EVO® LCD Arm received a Grand Prize in the 2011 Product Innovations awards sponsored by Buildings magazine at the 2011 NeoCon World Trade Fair. The all-new EVO® LCD Arm was honored by Contract Magazine with a ‘Silver’ Best of NeoCon award at the 2011 NeoCon World Trade Fair. A panel of industry experts selected EVO® for an award in the Technology Support category. The EVO® LCD Arm was awarded a Gold medal in Design Journal’s 2011 ADEX competition. ADEX is the largest and most prestigious awards program for product design of furniture, fixtures and finishes marketed to the design trade. The Cricket® Laptop Stand has received an honorable mention in the 2008 red dot design awards. Red dot ranks among the largest and most renowned design competitions in the world. Innovative joins other 2008 recipients such as Apple, Sony and HP. The Cricket® Laptop Stand has been awarded a 2008 Gold ADEX award. ADEX = Awards for Design Excellence. These awards are presented annually by Design Journal, an international trade publication for interior designers, architects and facility managers. In a Nov. 30 award ceremony drawing more than 700 to TimesCenter in New York City, Interior Design magazine selected the EVO® Laptop Arm for a Merit Award in its 2007 Best of Year Competition. Innovative is proud to have been selected in this competition sponsored and judged by the elite of the design community. The EVO® Tablet Arm has been selected by the editors of Buildings Magazine as a 2007 Editors’ Choice Top Product Pick. According to Buildings, “Knowledge workers will benefit from the EVO® Tablet Arm, allowing full-time use of portable computers without sacrificing comfort or ergonomics.” The choice was made based on factors such as performance characteristics, solutions applicability, and uniqueness. The EVO® Tablet Arm was awarded Silver in the Technology Support category of the 2007 Best of NeoCon competition, sponsored by Contract Magazine and presented at the 2007 NeoCon World Trade Fair in Chicago. Selected from among 400 entrants, the EVO® Tablet Arm uses an ingenious bracket mechanism to clasp laptops and tablet PCs of all sizes. The arm suspends the computer above the desk, allowing effortless adjustment of height and position. The Cricket® Laptop Stand was awarded a Citation of Excellence in Buildings magazine’s 2007 Product Innovations Awards, which showcase innovative solutions to today’s facilities challenges. Announced at the 2007 NeoCon World Trade Fair in Chicago, Cricket® is the first fully adjustable yet extremely portable ergonomic laptop support, delivering Props For Your Laptop. The EVO® Tablet Arm has been selected as a Cherry Pick for the 2007 Consumer Electronics Show. Cherry Picks are selected by Newstips, and presented at a special journalists-only event on Sunday January 7. Innovative will present the product to the media, and will also demonstrate it to the public in booth #70950 (Sands) at the CES, running January 8-11 in Las Vegas. Cherry Picks are presented by Newstips, a ‘journalist to journalists’, and the publisher of the weekly Newstips Bulletin. The prestigious red dot Product Design Award recognizes superior design quality and innovative design. Innovative is proud to accept a 2006 red dot award for the EVO® LCD Arm. EVO® melds high functionality with a striking design sensibility. Released in January of 2006, EVO® sets new functional and design standard for monitor mounts. The red dot award is presented by Essen Design Zentrum Nordrhein Westfalen in Germany. Presented by Buildings magazine, the 2006 Product Innovations Awards showcase innovative solutions to today’s facilities challenges. Innovative is proud to accept a Citation of Excellence for the EVO® LCD Arm. EVO® melds high functionality with a striking design sensibility. Released in January of 2006, EVO® sets new functional and design standard for monitor mounts. The International Forum Design Award is regarded as one of the most important design competitions worldwide. Awarded 1998 for the Model 7000 LCD arm developed for IBM’s Netvista line of flatpanel monitors. Awarded in 1999 & 2000 for the Model 7500 LCD arm developed for IBM’s X41 flatpanel monitor. Silver Winner in the 2002 Product Design Award in collaboration with IBM’s X41 Flatpanel monitor. Silver Winner in the Fall 2002 Yearbook of Industrial Design Excellence in collaboration with IBM’s X41 Flatpanel monitor.